The basic rules are simple, 7 players (3 inside, 4 outside the area) work together to keep possession and get the ball from one end to the other. 5 players (all inside the area) work together to prevent the opponents from reaching this objective. The end players are allowed to pass to each other but only on the ground. This 7v5 could be considered an advanced version of this training game. The following points are implicitly promoted through the design of the game, however they can, and some should, also be explicitly coached for further reinforcement. Perhaps the most important point to be coached is the co-ordination of positioning between the inside and outside players. 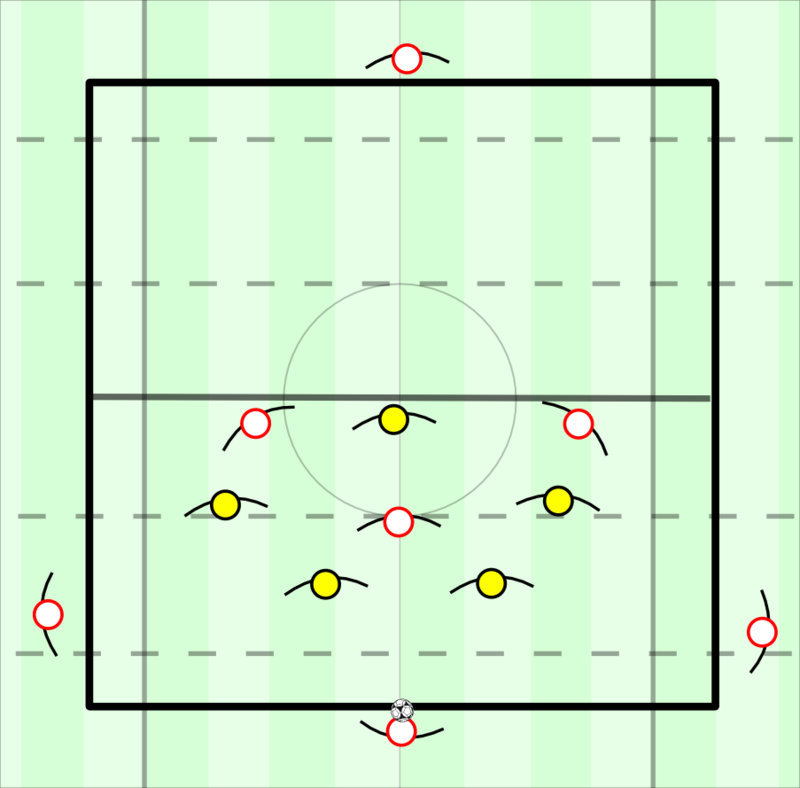 Whilst retaining a symmetric shape, the players have the potential to create a structure with 5 different lines. By playing on different lines the possession team can occupy more of the playing area whilst retaining good distances and potentially connections to one another. Furthermore, retaining depth is important to either make the defenders hesitant to press or to offer a route to escape if the opponents do press. This can be done in different ways, firstly with high inside players and deep “wide” outside players. Or deep inside players and high wide outside players. This structure-choice represents the specific positioning a team use when creating triangle structures in wide areas. The outside players represent full-backs and the central players represents “interiors” in a nominal 4-3-3. The choice of course depends on the coach’s game model which should be influenced by the abilities of the players. Variations in structure for wide triangles. Initially I encouraged my players not to stick dogmatically to either structure and even to switch between the two naturally. If they start one play with deep central players and high wide players, when the ball reaches the other end this will automatically become high central players and deep wide players. Thus it is easy and even natural to switch between the two structures. Another important point to stress is that the possession team should maintain presence within the opponents’ defensive block. This is crucial for manipulating the positioning and behaviour of the opposition defence. With a player positioned immediately within the opponents’ defensive block, it intuitively changes the priority for all the defensive players. Firstly, they will want position themselves to block the pass into their shape and to allow quick access to this player if the pass is made. As such this positioning creates more space for all the other players both within and outside the area. Any pressing opens a space/pass! Since the defensive team are underloaded their defensive style will intuitively be based around anticipating certain passes and blocking passes with use of cover shadows, particularly when pressing in advanced areas. Since the opponents are likely to move out of position early, composure is vital to avoid passing into areas that an opponent anticipated. When the players are able to create a strong structure in possession this leads to a hugely important point: every pressing attempt from the opponent opens a passing option, or a space to dribble into. Thus the players need to be taught to read the opponents pressing and observe whichever pass this creates. Me: If the defenders block X what can you do? Me: And if they block Y? Reinforcing this in various ways is key to explaining why and how certain behaviours, most importantly pass selection, need to be appropriately opponent-adjusted. 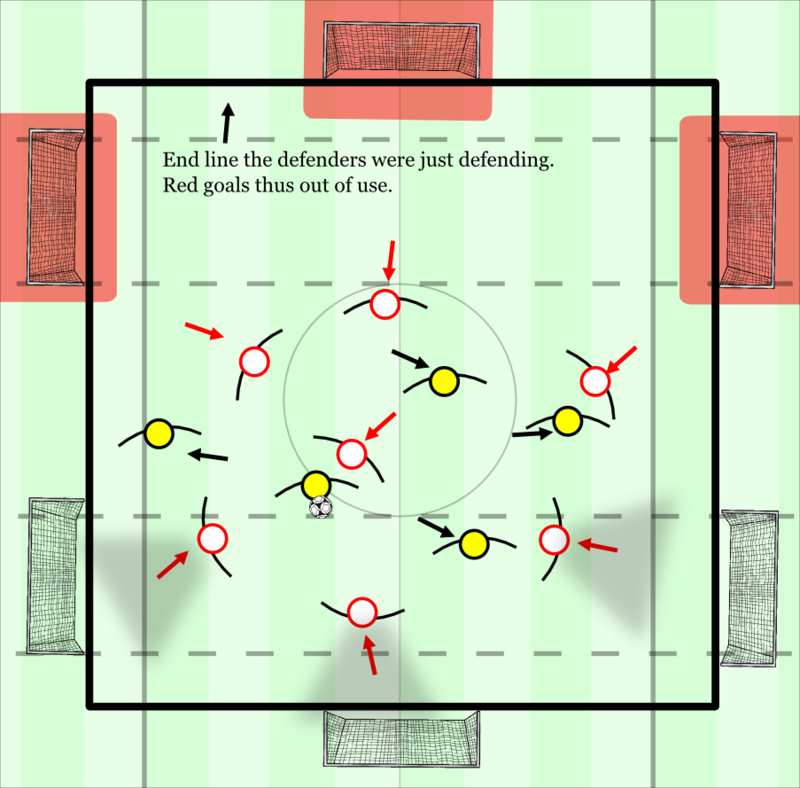 In order to work on the transition moment (and give the defenders a more rewarding objective!) the defensive team can be given goals to counter towards after winning the ball. These goals and rules can be placed to train the specific positions you want your players to cover immediately after losing the ball. I use 6 goals, one on the centre of each end line and two on each sideline. This is because I want my team to recover central positions quickly but deny the opponent easy exits towards the wings. The instruction for the defensive team is that they can only score in any of the “opposite” goals to where they were just defending. For the team defending these goals in transition the rule is that they are not allowed to stay on the sidelines. This is because I want them to counterpress aggressively and recover central positions with speed. So how can they combine this with denying easy exits to the flanks? The interaction between these aspects implicitly trains counterpressing with effective use of the cover shadows. They will have to create pressure in the centre to regain the ball but the first instinct will be to get into positions that allows them to block the passes. Another potential progression is to explicitly instruct the defensive side to press in different manners. This is for the purpose of training the possession team to play against both man-oriented and zonal defences. The players can be left to play against the different defensive types initially without any added instructions to observe what solutions the players come up with naturally and how their way of playing changes against the two. Instructions can then be added if the players struggle to adapt their mechanisms. Against a zonally defending opponent in a 3-2 block for example, the emphasis needs to be on positioning between the two lines of defence and using this to open space for other players to act. Using deep central players can be effective at this stage since they have the licence to dribble diagonally and target the space between the side forward and the wide defender. Against a man-oriented defence, the emphasis should be placed on how to open the most direct passing routes with effective movement and positioning. Of course positional rotations within the area should also be encouraged. 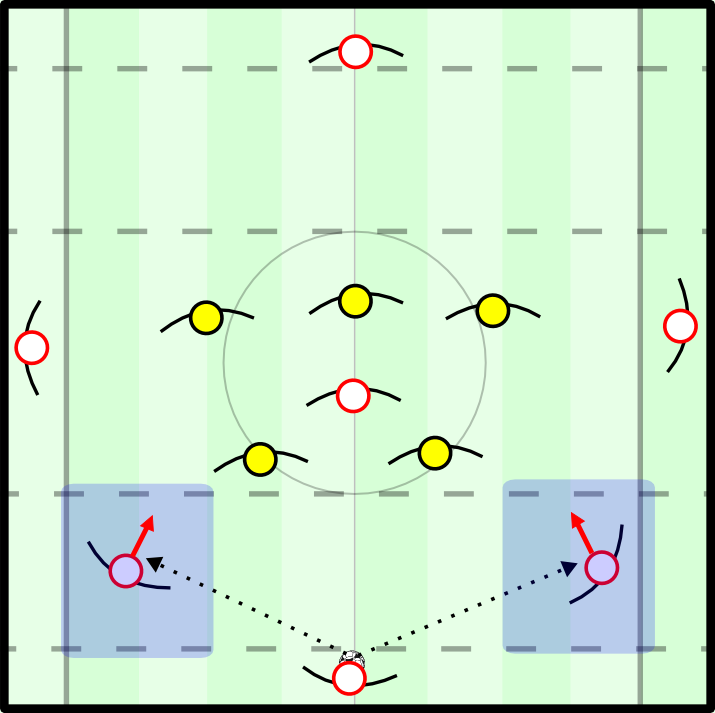 An example is the advanced central players swapping with the deepest midfielder to receive the ball without an opponent immediately behind if done correctly. Another potential way to progress the game is to introduce the offside rule to encourage more aggressive pressing from the defending side. A halfway line should be added where the players cannot be offside within their own half to ensure the defenders keep a realistic defensive line. Of course it is difficult to replicate the overall pressure of match situations however this can help the players learn to become more comfortable playing out from intense pressure. When I noticed that the players were too reliant on the wide players to progress to the other end I introduced the rule that only the players in the centre can make the pass to the target end. The two wide players were now only allowed to pass back into the centre or back to the end the play started from. This was to encourage better movement from the central players to get free. I spoke about methods of doing so such as double movements, effective blind side movement, balancing movements and receiving patterns such as dropping the shoulder to create more space to turn into. This became increasingly important because the defensive side now naturally focused more on defending central areas. The rule therefore had a defensive aspect to it also in implicitly teaching the players to prioritise defending central areas. 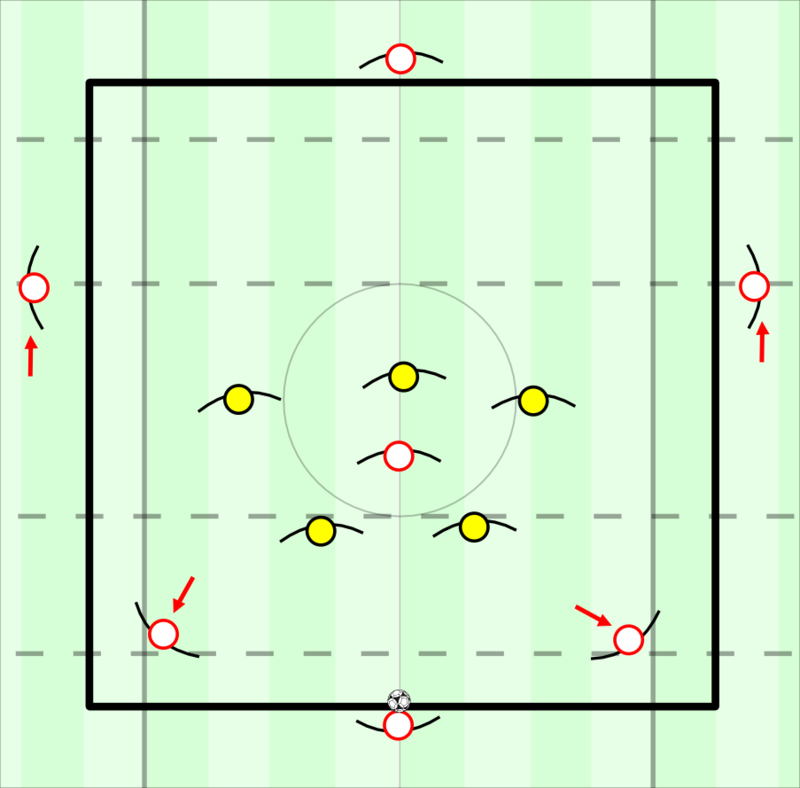 Since the central players were now the only ones who could pass to the target end the rule implicitly makes the central players position themselves higher and the wide players deeper. This is important since it ties in directly with my model where the 8s play high whilst the full-backs are deeper, playing on the line immediately above the centre backs. Of course this should be stressed as a method against man-marking, but it can also be useful for creating a dynamic advantage against a zonal opponent. The central players can be encouraged to switch positions dynamically with the outside players. The rule should simply be that at all times there must be 4 players outside the 3 players inside the area. For these rotations to have the desired effect timing is important. I spoke about how these rotations can have a particularly positive effect when done against the grain of the defensive shifting. This means the central players will be moving in a seemingly natural manner and as such the defensive players may not suspect or adjust to the incoming wide player. This along with going against the grain of shifting should give the incoming wide player a dynamic advantage. A key aspect of these rotations is the potential they have to create dribbling routes. In the first situation against the man-oriented opponent it initially helps to create a free man who then has space ahead of them to dribble and further disrupt the opponents’ structure. Against the zonal defence it has the potential to make passes into the central player more accessible since the dribbler can close the distance between them slightly. 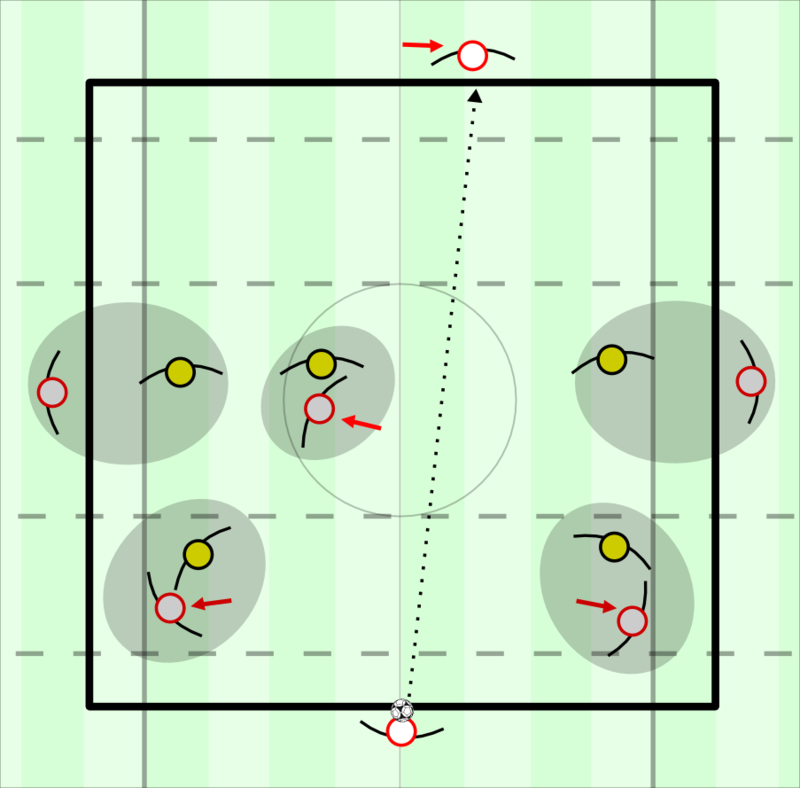 By using the central player they can “mis-direct” the opponent and create large space in wide areas since the opponents are likely to collapse on the ball. Great practice coach! So simple yet it can cover so many different aspects, I will give this a go sometime soon with my team. I don’t know if you have posted this type of article before but I hope to see more! Thank you very much for this cool article. Great Example, how to make progressions within a simple exercise. I don’t get, why the outside player has to dribble infield in the last GIF. The distance in this situation doesn’t seem to long, so it would make it much easier to reach the central player. I think, it would rather be a risk, because the defenders get closer to the former outside player, so they have a bigger cover shadow, and have more time to move towards the left side, close the gap between the lines and cover the central player. So the advantage of a fast shift would be lost. I’d love to read more about it. Firstly, he doesn’t have to of course, the purpose was to show how the rotation could create a dynamic advantage. It’s surely not perfectly illustrated, however the ball carrier should be able to draw the opponents towards him, and is thus a means of space opening. As you correctly said their cover shadow is larger, however a small manipulation of the angle can dramatically change the situation.